I'm a huge fan of spray-on sunscreen for the kids. It goes on quickly and dries fast, both important factors when you're trying to protect kids who are in a big rush to get into the water and away from mom. I've often thought that such an aerosol dispersal system would be a huge help in keeping kids' skin moisturized. We live in Kansas where it has been drastically, earth-crackingly dry for the past few years and despite my best efforts, Roo and Jasper hate using lotions, no matter how ashy and dry their skin gets. They hate how clammy moisturizer is on their skin and how long it takes to soak in. Recently, I received a sample of Vaseline Spray & Go Moisturizer, which just might be the answer. Vaseline Spray & Go Moisturizer Total Moisture: contains pure oat extract and leaves skin feeling healthy and skin. Vaseline Spray & Go Moisturizer Aloe Fresh: contains pure aloe and leaves skin feeling healthy and fresh. 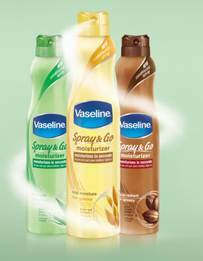 Vaseline Spray & Go Moisturizer Cocoa Radiant: contains pure cocoa butter and leaves skin feeling healthy and glowing. In accordance to the FTC Guidelines and the WOMMA Code of Ethics, I am disclosing that I received a product sample to facilitate this review. All opinions are, as usual, entirely my own. Ok, I'm utterly fascinated and can't wait to try this out!